I attended the Karmic Koala release party at the kwartzlab and had the opportunity to upgrade my laptop from the local repository. Everything went well except for the sound on the laptop. Thankfully the alphas, betas and RC periods are for people to find these issues and provide workarounds :D.
- Sound made a crackling sound. It seems that something from the previous version was causing trouble. I've been using Impress for some time to create presentations but I used to upload them as odp files when I wanted to share them with the world (in case the world came to see them). That is, until I "discovered" that exporting them to flash was a piece of cake. From the main menu select "File | Export"
On the Export window select "Macromedia Flash (SWF)"
Yesterday I was fortunate to participate in the Software Freedom Day organized by the working centre in Kitchener. There I had the opportunity to give three presentations. I'm posting them here in case anyone is interested in looking at them, modifying or using them at other events. In this presentation I walked through some of the current rights and freedoms regarding digital content. The ones we currently have and give for granted as well as some of the existing artificial barriers to enjoy those rights. The main purpose of this presentation is to make users feel more comfortable reading and understanding commands provided by other people as well as using the command line more effectivelly. This presentation shows some of the core differences between Windows and Linux which, when not well understood, become "annoyances" and entry barriers for adoption. This presentation is not meant to bash Windows in any way or to glorify Linux, but an (hopefully) objective and practical comparison. The deadline to make a submission to the Canadian Copyright consultations is September 13. Richard pointed out a guide with astroturfing instructions: http://faircopy.ca/participate/. This is my uninformed, blathering submission. It is less well-informed than an article published in the Waterloo Record. If I can make a submission, so can you! Note that I believe that making a submission is worthwhile even if there is a federal election and the bill dies. The last round of backlash probably contributed to this consultation. who require licence keys and registration for their software. infringement and certain to be enforced inconsistently. try to have it both ways. remix, then we are in trouble. such restrictions on our free expression, but that hope is faint. snatched away from copyright holders is unfair. simple task like playing a DVD on Linux becomes stupidly difficult. been developed by cable networks independently of TiVo. permission of the media companies before implementing its product. TiVo. One of the hot trends in the Internet realm is "mashing up"
lock sections of Bill C-61 stifle such creativity. technology does not mean it should be illegal. including those that don't exist whenever this bill is put into law. in many cases this will become illegal with digital locks enforcement. reasoning, and the copyright bill should reflect this. organizations such as Project Gutenberg. insights into our culture that are not contained anywhere else. Unfortunately, a lot of that culture could be lost unneccessarily. copyright could last ten years. as early as a year before the ten year period is up. 2. Copyright can be assigned in wills and by contract. the last renewal, it enters the public domain. of copyright renewal cheap, but we could legislate that. much more effectively than the current system. fight for it on the international stage. managed to achieve this goal. After much research and investigation, I have started in earnest on my streetposts project. I think I'm going to use net beans. I started to make a database today in OpenOfficeBase. I setup the structure of all of the tables according to google's specification, and set the primary keys. I made all of the tables using the names supplied by the google transit api. After, I was going field by field and setting up the sizes of the fields and entering descriptions (What is the maximum length for a description? ), as well as input masks. when I had it all the way I wanted it for the first table. I clicked on the save table button, and the majority portion of my recent work was destroyed, or maybe all of it. So I entered it again, and the same thing happened when I hit save. This is really frustrating. What is up with OoBase? :-( ! Here are the slides (and sources) from the August 2009 presentation on syslog servers. The slides are released under a Creative Commons 2.5 Noncommercial ShareAlike licence. See the tarball for licencing of the different slide components. Are you sick of cleaning viruses and spyware off your computer? Are you tired of nagware, time-limited trials, and sketchy download sites with lots of pop-up ads? Would you like to use software in a way that suits your needs and avoids treating you like a criminal? Does the cost of computing deter you from developing new skills and exploring new interests on the computer? If so, you should know about open source software. It gives you access to a wide variety of applications that are cheap but work well. Here are a few examples. OpenOffice.org is an office suite. PDFCreator lets you create PDF files from any application. The GIMP lets you edit photos, and Inkscape can be used to create beautiful logos and graphics. Scribus lets you create brochures and newsletters, and can even typeset books. Audacity is a sound editor. Tuxguitar lets you compose music. This handout explains what open source software is, the pros and cons of using it, how to get started, and where to get more information. Open source software are computer programs licenced so that you can legally use them and share them with others. In addition, you are allowed to study how the programs work and change them to better suit your needs. Computer programs that are not open source are known as proprietary software. Open source is also known as liberated software, software libre, free software, or by the acronyms OSS, FOSS or FLOSS. The terms "liberated" or "free" refer to the philosophy of "software freedom". By allowing people to use, improve and redistribute software freely, this philosophy aims to treat computer users less like consumers and more like participants. This is one reason open source software is available so cheaply. Software includes both applications (such as web browsers and word processors) and operating systems (such as Windows, Mac OS or Linux) that run on your computer. You might choose to install open source applications, open source operating systems, or both. One option is to install open source software on a computer that already runs Windows. This is a good option if you already use a legal copy of Windows. Many good open source applications for Windows are collected in the OpenEducationDisc we are distributing today. Another option is to install an open source operating system instead of Windows. One popular open source operating system is Linux (also known as GNU/Linux). Linux is often packaged together with applications into distributions. There are many different distributions available, but one of the most popular for desktop computers is called Ubuntu. Today we have the 8.04 release of Ubuntu available, also known as Hardy Heron. Installing Linux can be a good option if you have a spare computer that needs software, if your current computer does not have a legal version of Windows on it, or if you are adventurous and will not aggravate the other people who also use your computer. There is also lots of open source software available for Mac OS X and other operating systems. We are not distributing such software today, but feel free to contact us for resources. You can use open source software legally and at low cost. This is especially important because illegal software (especially illegal copies of Windows) do not qualify for security updates, leaving your computer more vulnerable to viruses, worms and other computer nasties. Lots of open source software exists, including good-quality alternatives to many popular applications. Software for niche interests varies in quality but is often available. Depending on your interest there may already be a community of people who use and develop open source software for that need. With open source software, you usually get full versions of products -- not trial versions, ad-laden nagware urging you to upgrade to a paid product, or "home" versions with reduced functionality. Open source software exists in a culture of sharing and collaboration. Users help each other with technical support. Open source software is freely given; you can use it without feeling slimy or dishonest. You can also copy installation discs and give them to others legally. If you are interested in jobs in the computer industry, open source is invaluable because it gives you access to the same software tools that are used to power mail servers, webservers, supercomputers, and smart phones. Developing proficiency in these technologies can make you more employable without costing you a lot of money. There are many opportunities to contribute to open source software, and you are encouraged to do so. You might support other users, write documentation, file bug reports, or contribute a plugin to make the software you use better. Contributing something back can do a lot to boost your self-esteem. Many projects also accept financial contributions. Every decision has benefits and costs, and the decision to try open source software is no different. Here are some of the most common frustrations people encounter when using open source software, along with some ways people get around these issues. Conversion between open source data files and their proprietary counterparts is not always perfect. For example, a resume created in OpenOffice.org might look different when opened in Microsoft Word. One option is to distribute documents in PDF format, which is easy to generate and looks the same everywhere. You may find that open source software looks and behaves differently than proprietary alternatives you are used to. Sometimes features are missing or incomplete in the software, or you have to use the software in a different way to achieve the same result. Getting help for open source software can be difficult. If your local computer shop (or the wizardly friend or relative you turn to with your questions) does not use or support open source software, you will need to look elsewhere for help. Some online forums (such as the Linux Questions or Ubuntu Help forums) can offer good support. Mailing lists and forums devoted to specific applications also exist. You can participate in a local user group like KWLUG, where people meet and discuss open source issues. The folks at Computer Recycling can also answer some of your questions. None of these groups will do all your computer maintenance for you, but they can help you with specific questions and direct you to places where you can get additional help. It can take additional work to get movies and music files to play under Linux (this tends to be easier in Windows). In some countries, open source software to play DVDs and MP3s is restricted or legally unclear, so Ubuntu and other distributions do not release such software officially. Not all hardware is supported well in open source operating systems. For example, Linux support for printers, wireless cards and video cards can be spotty. It is best to check that your hardware is supported in Linux before attempting to install it. Sometimes you can cheaply replace components that do not work under Linux with others that do. Open source exists in a "do it yourself" culture. If features don't exist in software that you are using, the program developers will often give you the options of waiting patiently, paying somebody to develop the features you want, or developing those features yourself. This attitude can be frustrating, especially to those of us who are less technologically-savvy. Sometimes a different open source project supports the feature you need. Sometimes there are ways to work around the limitation until the feature you need is implemented. Like other software, many open source projects assume you have internet access when installing and using their products. It is certainly possible to install and use most of this software without internet access, but it can be tricky. This is especially true for Linux distributions, which break up applications into packages that depend on each other. Because it is so easy and cheap to release open source software, the software quality varies dramatically. The health and quality of open source software depends on its support. Applications that are well-supported (by a strong community user base, a foundation or a corporation) tends to work better and be more featureful than software written by lone individuals in their spare time. Introduction to Linux workshops later this year. If you are interested, you can sign up at the booth or contact Charles. As the name suggests, the Kitchener-Waterloo Linux Users Group (KWLUG) consists of people interested in Linux in particular and open source in general. The group runs monthly presentation meetings at the Working Centre, and hosts a lively e-mail discussion list. The group is free to join, and people of all skill and interest levels are welcome to participate in KWLUG activities. See for more information. 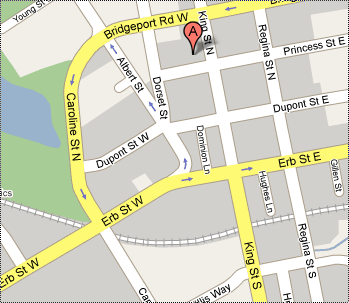 The Kitchener-Waterloo Internet Users Group (KWIUG) is a general-purpose education group that deals with a wide variety of topics relating to computers. They hold occasional meetings and also have a mailing list. See http://www.kwiug.org for more information. Ubuntu is a popular Linux distribution for desktop computers. See http://www.ubuntu.com for more information. The Linux Questions forum at http://www.linuxquestions.org is a web forum which helps Linux users troubleshoot computer issues. It contains a lot of good information in its archives, and the members tend to be friendlier than on many other internet sites. The Open Source Alternatives website http://www.osalt.com lists open source alternatives to common proprietary software products. This document was prepared for a day of workshops called "Living With Less Money" held on May 2, 2009. 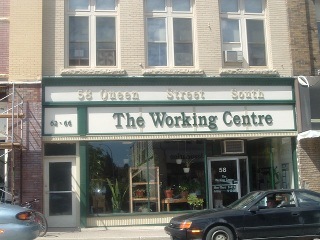 The event was organized by The Working Centre in Kitchener, Ontario, Canada. Much of the content reflects the setup of the day (we distributed CDs of software) and local resources (such as KWLUG and KWIUG). However, this version of the document is "forked" from the original, and thus are mine and not the official views of the Working Centre. This document is licenced such that you can customize and redistribute it for your own use. In doing so you will want to reflect the local resources in your own community. Thanks to members of the kwlug-disc mailing list for their constructive criticism and suggestions for improvement. KWLUG members Khalid Baheyeldin, Darcy Casselman, Robert P.J. Day, Chris Frey, Adam Glauser, Oksana Goertzen, Bob Jonkman, John Kerr, Andrew Kohlsmith, Jason Locklin, Charles McColm, Lori Paniak, Kyle Spaans, Raul Suarez, Bill Switzer, John van Ostrand, Richard Weait all contributed to the discussion. Thanks to Working Centre members Michael Bernhard, Paul Harvey, Sergiane Nascimento and Rodrigo Salinas for their edits and contributions. Living Well with Open Source by Paul Nijjar is licensed under a Creative Commons Attribution 3.0 Unported License. Thanks to John Kerr for providing these. You are a rockstar! When I upgraded from Linux Mint version 6 "Felicia" which is based on Ubuntu 8.10 to version 7 "Gloria" based on Ubuntu 9.04 my video performance started suffering badly. Worst of all, I couldn't watch videos using any of the applications installed vlc, miro, gmplayer, mythTV, Totem. I don't know if changing gstreamer-properties Default output to "X Windows System (No Xv)" had any effect but it is working so I also left it. Just in case you are wondering. Here is the result of "lspci -nn | grep VGA"
So this solved it for me. I am no longer getting the error in Xorg.0.log and my video performance is better than before. MythTV, vlc and gmplayer work at full screen using a fraction of the CPU. Still some choppy video with Miro, and Totem is not displaying video but I am not getting the error. I already had a post on undeleting files from an NTFS partition. But what if the partition is a FAT partition? Don't worry there are several solutions that will only require you to use a handful of commands. That one is kind of a brute force as it just looks for files ignoring the file directory or directory structure but it is dead easy to use. It's done wonders when undeleting files from USB memories and camera memories which were accidentally deleted by pressing the wrong button in the Camera. Then match the mount point with the partition name. Now you can navigate the "card" folder using your favourite file manager and copy the files somewhere else. And Linux saves the day again. My son installed an application but mistakenly he selected the data directory as the installation directory. When he realized it he decided to uninstall, but the full uninstall deleted everything from the folder. This is: the program and all his files. The solution was very easy. I found that I had already installed the ntfsprogrs package. This package contains a pretty slick utility called ntfsundelete. This utility allowed me to first list the files that I could recover and then recover them. Percentage recoverable: In some cases you want to salvage whatever you can, in some cases you only care if you can recover 90% or more, for example. In my case it was a breeze to use it. That created a file called deletedmp3.txt with a list of files. Here are thee instructions I followed to set up Linux on my PS3 the way I like. Why? : It was the first distribution available and I got my PS3 right after it was released. It also seems to be the best supported. Why? : E17 looks nice but it is still lacking specially when jumping from workspace to workspace. Besides I needed more configurability as you'll see in the next section. In the log in screen click in the "Sessions" menu and select Gnome. Why? : Two reasons. By default it is configured with overscanning and at 1080p on a 32" screen I can barely read the fonts when sitting in my sofa. font_name = "DejaVu Sans 20"
Why? : To use the YDL repositories you have to subscribe (translation: pay). There are other repositories that provide even more software variety. Follow the instructions for the YDL repositories and Fedora repository from http://news.softpedia.com/news/How-to-Enable-Video-Playback-in-Yellow-Dog-Linux-6-1-101664.shtml. Note: Do not do the steps for livna-stable or dribble!! Why? Sony allocated limited resources for GNU/Linux on the PS3. Running a lighter window manager makes the UI more responsive. Open a terminal and execute the following to install Openbox components. Check "Automatically save changes to session"
Uncheck "Automatically save changes to session"
Note: The instructions regarding the repositories are a little bit outdated. Refer to the section "Install additional software repositories" above for notes on what repositories install. Other than that, the instructions work like a charm. Why? : well, How cool is to connect to my office network sitting in my sofa, open a remote desktop connection to my office computer and work in a huge monitor! and entering your network parameters. Here I am, trying to learn a new programming language. Actually it feels more like getting to know the child of an old friend. Vala is a little bit like C but in a modern way and a lot like C# without having to install a huge runtime when you just want a "Hello world"
I am using Mint. An Ubuntu derivative so these instructions reflect that. I'll first share my odyssey and then the instructions that actually worked. Installing Vala is very easy as it is already in the repositories. After installation I was able to follow the tutorial..
After I installed vala I set up to try "valide" a vala specific IDE and that's when my problems started. I downloaded GtkSourceView from the official repository, compiled and installed according to the instructions. Tried to "configure" valide again but failed complaining about libvala being an an older version. Back to uninstall vala and libvala from the repositories. Downloaded the latest vala release 0.5.6 and tried to "./configure". It complained about configure: error: flex not found but required so I downloaded other versions, same error. Well, apparently an undocumented dependency. I installed flex from the repositories. Finally I was able to compile and install vala but when I tried to compile my "hello world" I got an error loading the libraries. I searched for a solution and found that vala must be configured with prefix=/usr. I downloaded the tar.gz source for valide and tried to compile valide again. More problems. I tried using different versions of vala until I finally found that the only version it worked with is vala 0.5.1! After that, valide compiled... but when launching gave an error finding libraries. So, uninstall, distclean and reconfigure valide with prefix=/usr. wpa_passphrase myNetwork "This is my passphrase"
3. Disable the Network manager. EDIT: No longer necessary as of Mint 9 Isadora as it already has the libraries and parameters to do this automatically. Disclaimer: The actions described here are suitable for a Home desktop. I would not do the same to a laptop or public desktop. I'm trying to convince my sons to use Linux instead of booting in Windows. They really dislike having to enter the userid and password then enter the keyring password. For now, they don't care about having their "own" desktop or custom configurations. I have no problem with those steps. The second one is anoying but I quickly forget about it and just do it naturally. This is the part that my sons dislike. Note: Both of my desktop connect through wireless as I've been lazy running hidden cables all over my house. My first step was to remove the anoyance of the keyring password. Once I did that I realized that it was better to have a static IP. After all, these are desktops. Finally I decided to set automatic log in. Although I am using Mint in one box, Ubuntu Intrepid in another. Being it an Ubuntu derivative all the steps apply to both. After those steps, my sons are using Linux more frequently. Weird, but true. Note: Being these computers inside my home without normal access by any stranger, I decided to use the Automatic login feature of the log in manager. After all, everyone at home knew the userID and password and if a rober comes into my house a password won't stop him from taking the computer. 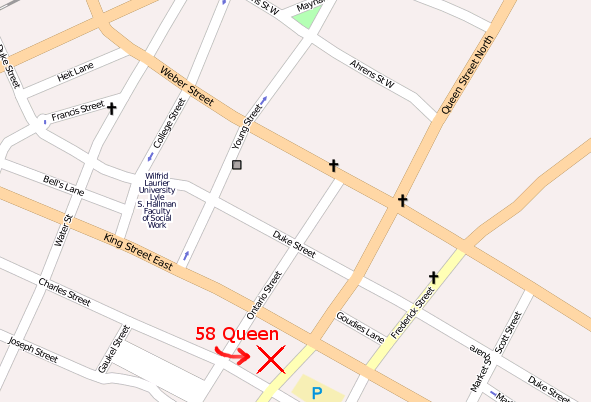 I am trying to upload information about 58 Queen Street. Here is a picture! Mozilla is including support natively in Firefox with Version 3.1.
free and open source software. have greater incentive to create content in this format. There are FLOSS supporters making the case for the open source CODECS. are no longer forced to use proprietary formats. support for sound and video. Another brick in the wall is gone. I have been blogging, but at another site. You may be interested in my latest blog entry which is a swipe at Bill 61 without mentioning Bill 61. I would encourage everyone to speak out against the DRM aspects of this Bill. This Bill may have been tabled before Summer Break so that we can make our thoughts known about it. I also have a comment on the Globe and Mail website. DRM is useless because most of us are spending money in different ways instead of records (CDs). Recent trips to the gas station alone has devoured a lot of discretionary spending dollars.